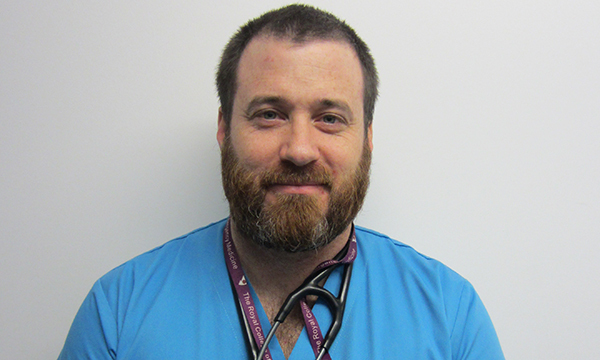 Advanced clinical practitioner trainee Mark Case @AENurseUK says teamwork and technical skills are crucial – and so is knowing when to hold someone’s hand. I used to work as a healthcare assistant and did bank shifts in the emergency department (ED). While there, I was drawn to the unpredictable nature of the work, the challenge of delivering high-quality care in a chaotic environment. No matter what your role is, you are an important component of the emergency team. The resourcefulness of the nursing staff impressed me and I thought ‘I want to do that’. Advanced clinical practitioner (ACP) trainee at the University Hospital Southampton emergency department, lead for the trauma immediate life-support course in our department and lead for major-haemorrhage protocol training. I am doing the Royal College of Emergency Medicine ACP adult-curriculum training. Once credentialed as competent, I will manage care for undifferentiated patients attending the ED through to discharge, admission or referral. How and where have you developed your emergency care skills? In my first emergency care job, I rotated between an acute admissions unit and the ED. It taught me that being an emergency nurse is about teamwork, being organised and remaining calm. I also worked in the Cook Islands, in the South Pacific, in a department with limited resources. We saw significant amounts of trauma due to drink-driving as wearing a helmet on a motorbike was not a legal requirement. Nurses also attended the 999 calls, which was very challenging without any pre-hospital experience. My passion for trauma care started when I became a primary-care trauma instructor and helped deliver the first trauma course by staff for Cook Islanders. I also worked in Guernsey, which has a non-NHS healthcare system. This was where I had my first charge nurse post. Over the past four years, I have worked as a charge nurse and then senior charge at Southampton ED, which is a major trauma centre. Being part of a team delivering high standards of care in a challenging environment and seeing the positive impact this has on a patient’s condition. It amazes me what the NHS delivers for patients day to day. Over the past year, I have been developing training to improve the department’s delivery of massive haemorrhage transfusions, focusing on safe and quick delivery of blood products. This is done by training a small cohort of nurses through timed challenges, simulation and the use of skill stations, to increase exposure and role confidence. Since the training, adverse incidents have been reduced. You need to realise that every patient is someone’s loved one and treat them like you would want one of your own family to be treated. Although being able to perform technical skills is an important part of being an emergency nurse, it is also about knowing when to hold a person’s hand. What advice would you give a nurse who’s starting out in emergency care? Ask lots of questions. Keep learning – it will help the patients you look after get the right care sooner. Look after your own well-being and look out for your colleagues; you are part of a team. The continued lack of funding for mental health has put increasing pressure on emergency departments. As a service, we need to be actively involved in providing a solution to this growing crisis.